Experience Advent as never before! This Advent don't get caught up in all the busyness. Don't get lost in the anxiety of preparing for a day. Prepare for Jesus’ birth as Mary did. Do you want to experience real transformation this Advent? This year, walk with Mary and learn how she prepared to welcome Jesus into her life. Mary’s encounters and experiences as she carried Jesus will shed light on Advent for all of us. Advent is a special time of year to gain spiritual fruits, particularly peace and joy. A special mediator of these graces is our Blessed Mother Mary. In her humanity, she responded with virtue in a special way when the Lord Jesus entered into her life. Her response teaches us lessons that we can best learn from her in the history of salvation. Find yourself truly changed as you travel to Christmas Day. 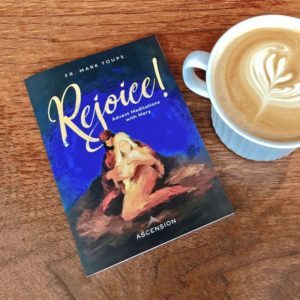 Join us for Rejoice! Meditations with Mary, a prayerful and engaging video retreat here at Saint Mary of Gostyn for all parishioners. Intentionally enter into this season of Advent, with Father Mark Toups, Sister Miriam James and Father Josh Johnson as your companions on this journey. Extend your Advent prayers and reflections with weekly emails from Father Mark Toups, if you choose to opt in and register at www.rejoiceprogram.com through Ascension Press. Advent is a special opportunity to draw closer to the Lord: a time to slow down, be diligent and watchful, to await his coming in new and profound ways. With Mary, we pray and ponder, being attentive to what the Lord is doing in our lives and where the Holy Spirit is leading us. “And Mary kept all these things, reflecting on them in her heart” (Luke 2:19). St. Mary of Gostyn Rejoice! No, I am not interested in the email reflection.